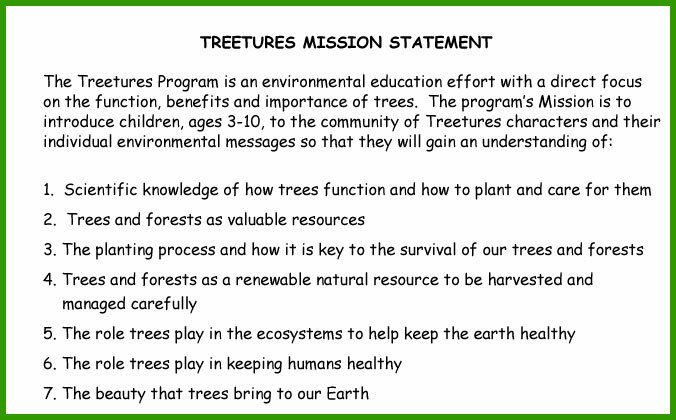 The Treetures Environmental Education Program was developed to raise young children's awareness of the need to respect and care for the environment. Judith Hope Blau, LLC has licensed the Treetures Environmental Education Program, pro bono, to its environmental partners. The Program was designed to enhance and assist the mission of youth groups, schools, communities, government agencies and tree planting/tree care organizations that share the goal of educating children about the important role trees play in keeping our planet healthy. Judith Hope Blau, creator of the Treetures, asks that we all set an example of corporate and personal volunteerism by planting locally so that we can make a difference globally.